Big Pharma CEO Martin Shkreli pledged his support and donated to Bernie Sanders this week. So how did Bernie respond? By taking the money and giving it to a health clinic in Washington. Remember Martin Shkreli? In case you don’t, Shkreli, CEO of Turking Pharmaceuticals, is the man that raised the price of a drug last month by 4,000 percent—from $13.50 to $750 per pill. The drug, Daraprim, is the only treatment of a rare parasitic infection. Shkreli tweeted his support for Sanders live during this week’s Democratic National Debate and has been trying to get a meeting with the Vermont Senator for weeks. He was been repeatedly turned away though, resulting in him making a $2,700 donation in an effort to get Sanders’ attention. On Thursday, Michael Briggs, campaign spokesman for Bernie Sanders, announced that “We are not keeping the money from this poster boy for drug company greed,” but will instead make a $2,700 donation to Whitman-Walker health clinic in Washington. Although Shrekli supports Sanders call for free public college and mental health care, he doesn’t agree with his stance on drug prices. He claims that he donated in an effort to get a meeting with Sanders in order to explain why drug companies set the prices the way that they do. Shkreli also tweeted about his donation during the Democratic National Debate on Tuesday, along with the claim that soaring drug prices are what pays for research and development on drugs for the future. So what do you think? Did Bernie make the right move? Do you agree with Shkreli that it is okay to raise the price of a drug by 4,000 percent to make up for paying for research and development? Turing Pharmaceuticals’ CEO Martin Shkreli might have raised the price of Daraprim to a ridiculous amount, but the medication is not trademarked leaving the possibility to replicate the drug available. A competitor from San Diego has done just that and will be selling the medication for a much cheaper price. Last month, Turing Pharmaceuticals sparked global outrage when CEO Martin Shkreli raised the price of a drug called Daraprim from $13.50 a pill to $750. Luckily, the medication is old enough that there are no trademark restrictions on it, so other companies are free to develop an identical medication at a lower price. It took roughly one month for a competitor to come on the scene and offer a lower price. This week, the San Diego based Imprimis Pharmaceuticals, Inc. announced that it would be offering an alternative for roughly $1 per pill, or $99 for a 100-pill supply. The company also announced that they will be making identical versions of expensive drugs so they are more affordable. Imprimis said that they were inspired to provide an alternative after last month’s price increase of Daraprim. Martin Shkreli, “the most hated man in America”, has been arrested on charges of security fraud, unrelated to his price gouging. He was the Big Pharma CEO that raised the price of Daraprim, used to treat HIV and AIDS patients as well as toxoplasmosis, by 4000% earlier this year. Shkreli raised the price from $13.50 per pill to $750 per pill overnight. On Thursday Shkreli was arrested on Thursday and has been charged with securities fraud. The charges are not related to price gouging, but to his time as a hedge fund manager and running Retrophin, a biotechnology firm. If you can afford our drugs with insurance, great. If you can't, you can have it for free. Our system works. @MartinShkreli you may want to address the physicians who addressed Congress who said that wasn’t true. After the backlash he attempted to donate to Bernie Sanders in order to get an audience with the presidential candidate, which backfired. Sanders refused to meet with him and donated his gift to a health clinic. Charges against Shkreli carry a maximum sentence of 20 years in prison. Notorious for raising the price of a lifesaving drug by 5,500%, Turing Pharmaceuticals CEO Martin Shkreli was arrested Thursday for allegedly participating in three interrelated multimillion-dollar fraud schemes. Charged with securities fraud, securities fraud conspiracy, and wire fraud conspiracy while defrauding investors and misappropriating assets, Shkreli became the most hated man in America after falsely promising to lower the price of Daraprim and later telling reporters that he should have increased the price even higher. A scapegoat is a person or animal which takes on the sins of others, or is unfairly blamed for problems. The concept comes originally from Leviticus, in which a goat is designated to be cast into the desert with the sins of the community. Other ancient societies had similar practices. In psychology and sociology, the practice of selecting someone as a scapegoat has led to the concept of scapegoating. After purchasing the rights to a drug that prevents infections in people with weakened immune systems, including AIDS patients and cancer survivors undergoing chemotherapy, Turing Pharmaceuticals CEO Martin Shkreli raised the price of Daraprim by 5,500% this summer. Instead of paying $13.50 per pill, patients with life-threatening illnesses are now forced to pay $750 per pill. Led by a former hedge fund manager, Turing Pharmaceuticals was founded by Shkreli after his first startup biotech company, Retrophin, ousted him last year amid accusations of stock impropriety. According to the seven-count indictment, between September 2009 and September 2014, Shkreli and his co-conspirators orchestrated three multimillion-dollar schemes to defraud investors and potential investors in MSMB Capital, MSMB Healthcare, and Retrophin. Between September 2009 and January 2011, Shkreli failed to disclose to investors that he had lost all the money he managed in Elea Capital, his prior hedge fund, and that Lehman Brothers had a $2.3 million default judgment against him. Shkreli lied to his largest investor telling him that MSMB Capital had $35 million in assets under management, when in fact it had less than $700 in its bank and brokerage accounts. After Shkreli bilked approximately $3 million from eight investors, MSMB Capital failed to settle a trade of over 11 million shares of Orexigen Therapeutics, Inc. (OREX) that Merrill Lynch ultimately closed at a loss of over $7 million. While providing investors with fabricated performance updates, Shkreli also allegedly misappropriated more than $200,000 from MSMB Capital to cover his personal and professional debts. Following the subsequent collapse of MSMB Capital, Shkreli began soliciting investments for MSMB Health while concealing his disastrous past performance, including the $7 million liability that Shkreli owed Merrill Lynch for the February 2011 OREX trades. From approximately February 2011 to November 2012, Shkreli also falsely represented that MSMB Healthcare had $55 million in assets under management. After acquiring $5 million from 13 investors, Shkreli improperly used MSMB Healthcare assets to pay for obligations that were not its responsibility, including the failed OREX trades. In an effort to pay off Shkreli’s personal and professional debts, Shkreli, Greebel, and their co-conspirators engaged in a scheme to defraud Retrophin by misappropriating its assets between March 2011 and September 2014. After reportedly lying to the U.S. Securities and Exchange Commission (SEC), Shkreli and Greebel caused Retrophin to pay more than $3.4 million in cash and stocks to settle claims with seven MSMB Capital and MSMB Healthcare investors. “The charges announced today describe a securities fraud trifecta of lies, deceit, and greed. As charged, Martin Shkreli targeted investors and retained their business by making several misrepresentations and omissions about key facts of the funds he managed. He continued to lie about the success of the investments and used assets from Retrophin to payoff MSMB investors. In the end, Shkreli and Greebel used a series of settlement and sham consulting agreements that resulted in Retrophin and its investors suffering a loss in excess of $11 million. While the charges announced today are significant, they are but one example of what’s left to come as the FBI continues this investigation,” stated FBI Assistant Director-in-Charge Diego Rodriguez. In 2014, Retrophin’s board fired Shkreli and later sued him for breaching his duty of loyalty to the company. After purchasing the exclusive rights to sell Daraprim, Shkreli gained notoriety by suddenly raising the price of the drug by 5,500%. He also recently bought an unreleased Wu-Tang Clan album for $2 million and sent a campaign contribution to Sen. Bernie Sanders, but the presidential candidate refused to accept the dirty money. 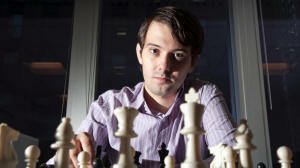 Last month, KaloBios Pharmaceuticals named Shkreli its new chairman and CEO. Immediately following Shkreli’s arrest on Thursday, its stock fell by more than half before trading was suspended. According to U.S. Attorney Capers, the charges against Shkreli carry a maximum sentence of 20 years in prison. Blatant lies, PR cover-ups, and a culture of total impunity are now central to the corporate business model. As a raker of muck, it’s my job to root out the nefarious doings and innate immorality of the corporate creature. But these days I’m being rendered obsolete by how ordinary corporate nefariousness has become. The wrongdoings of major corporations, and even entire industries, are now so commonplace that one hardly has to root them out at all. Their corruption is constantly oozing to the surface of today’s fetid corporate swamp on its own. What’s happened is that a profiteering imperative has taken hold of the executive suites. Not content with merely making a profit, CEOs are out to make a killing — no matter what it costs the rest of us. This has turned them into rank thieves — who are richly rewarded for exploiting America’s workforce, plundering the environment, and corrupting our government. Top executives have seen that they’ll pay no personal price for rapacious behavior, since the corrupted political and judicial systems show no serious interest in prosecuting perpetrators who get caught. In recent months, two huge examples of this rampant crime spree have erupted. In one, after Big Pharma bought out several reasonably priced medicines from independent drug makers —including a vital AIDS medication — the avaricious giants immediately gouged unsuspecting patients by quadrupling their prices or worse. In the other, Volkswagen joined the automobile hall of shame by secretly rigging computers on its much-hyped “green” vehicles to hide the fact that they actually spew horrendous amounts of pollution into Earth’s atmosphere. America is experiencing a dangerous transformation, through which the global elite has used every tactic available in a conspiracy to hoard an even greater share of wealth and reduce the world's population. And it is working. Many Americans have been drawn not toward life but toward servitude and death. In America and in the world as a whole, entire populations have been culled for profit and control. Elites have used the so-called GOD syndicate -- Guns, Oil, and Drugs -- as well as toxic air, water, food, and medicines, and of course, the toxic financial system on which the whole master plan depends -- to reduce the world's population. This is due to the belief of the global elite that the basis of all the world's problems is overpopulation -- just too many people using the earth's limited resources. Guns, Oil, and Drugs are the top three revenue-generating commodities in the world today, and they form the financial backbone of the global elites. All three are trafficked internationally, generating huge profits for those who control them, and are becoming ever more important in today's economy. America has gone to war for oil, supplied its military (not to mention private citizens) with firearms, and been complicit in a global drug trade. And behind the scenes, a wealthy elite has profited tremendously from all three.